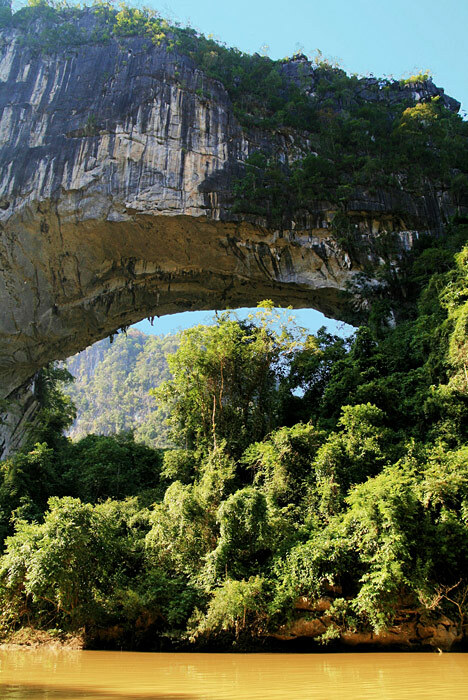 Fairy Bridge (Xian Ren Qiao) in Guangxi Province, China. Photo by Gunter Welz (click image for larger version). Fairy Bridge (Xian Ren Qiao) is a meander natural bridge carved through limestone karst by the Buliu River. 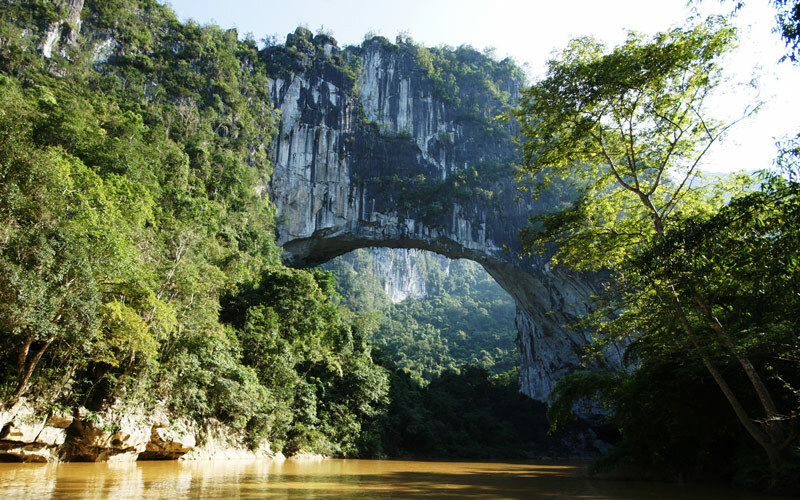 It is located about 40 km (as the crow flies) northwest of Fengshan in northwestern Guangxi Province, China. Very few westerners have seen this bridge. A group from the Natural Arch and Bridge Society, led by Ray Millar, visited Fairy Bridge in October 2010. During this visit measurements by Gunter Welz established that the span of the opening is 400 ± 15 feet and confirmed that the arch has the greatest known span in the world by a wide margin (see Measurement of Fairy Bridge). 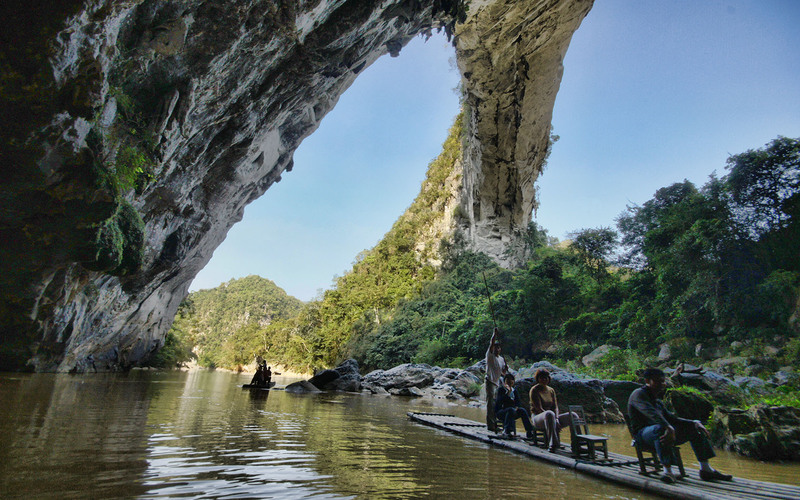 From the upstream side, Fairy Bridge can be reached via a rubber-raft boat trip down the Buliu River from the village of Buliu. This trip takes about three hours and goes through several minor rapids and a couple of larger rapids sufficient to get the passengers wet. A photo from upstream is below. Fairy Bridge from upstream. Photo by Ray Millar (click image for larger version). From the downstream side, Fairy Bridge can be reached via bamboo rafts with wooden chairs attached to them, which are propelled upstream using poles. A landing area only a short distance downstream from the bridge provides the exit point for the rubber raft trips and the starting point for the bamboo raft excursions. This landing area is accessible only by unpaved roads (as of the end of 2010). Underneath Fairy Bridge. Photo by Gunter Welz (click image for larger version). Fairy Bridge from downstream. Photo by Gunter Welz (click on image for larger version). Until recently, Fairy Bridge has been virtually unknown outside of China. NABS first became aware of it in 2009 when Jay Wilbur was searching the area via computer using Google Earth and spotted what looked like a large natural bridge spanning a river. This was quickly confirmed by a Panoramio photo linked to Google Earth, taken by the Chinese photographer “ivanytng.” Estimates using Google Earth and other photos suggested that the span might be the largest in the world. This inspired Ray Millar to arrange a trip there, which proved difficult, and his first attempt to reach the arch in 2009 failed. 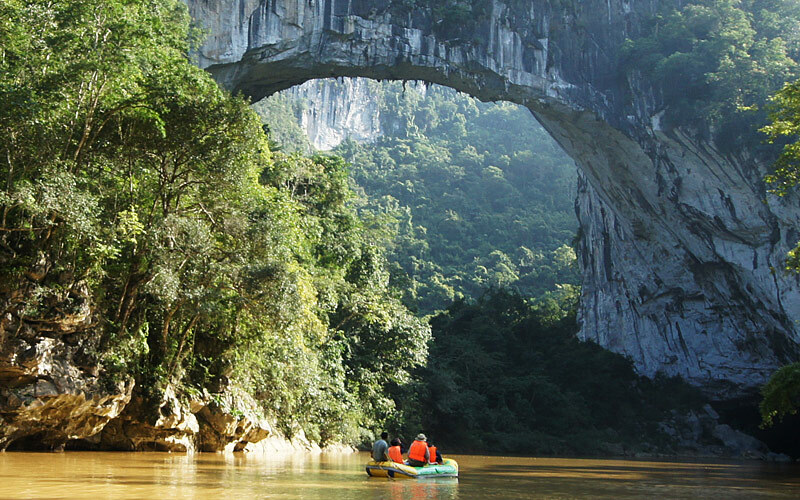 A second effort in 2010, attended by six other NABS members, was successful, due in large part to pioneering efforts on the part of China Odyssey Tours, based in Guilin, China.